Before beginning this step, you should have confirmed your unit’s Fall TIPS champions. Now you’ll work with the champions and nurse manager to decide on the poster format to be used, train nursing staff, and set the date for starting poster use with patients. Using the Fall TIPS Implementation Checklists (there is one checklist specifically for champions, and another for nurse directors) work with the champions and nurse director to ensure everyone is aware of and understands their roles and the steps involved in implementing Fall TIPS. Whether using the laminated Fall TIPS posters or printouts from the electronic version of Fall TIPS, they should always be at the patient’s eye level near the communication board, and should always be visible to hospital staff, patients, and patient families. The laminated reusable poster attaches to the wall or communication board with Velcro. Between patients, nursing staff simply wipe off the poster and start with a clean version for the next patient in the room. In units that use the electronic version of Fall TIPS, within the EHR system: nursing staff conduct the fall assessment within the EHR, print out the patient’s Fall TIPS plan and attach the printout to the communication board with a magnet or clip, or place it in a plastic holder. When a patient is discharged, staff remove and securely discard the printout to protect patient privacy. Our team has developed and validated an 11-item Fall Prevention Knowledge Test. We encourage you to use to tool to evaluate your staff’s knowledge before and after using our training resources. You can contact our team if you would like to access your team’s Fall Prevention Knowledge Test results. Work with the nurse director to set up a schedule for delivering the Fall TIPS Training presentation to all unit staff. Consider setting up enough sessions to ensure that all staff can attend. Your kickoff date is the date when the Fall TIPS posters will start to be used with patients. This date should ideally occur once 80% of staff have been trained. 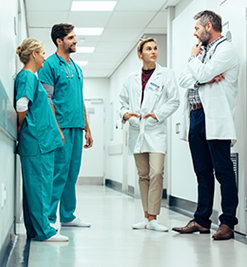 Some implementations have benefited from holding a “kick-off week,” where once or twice a day, implementation leaders and champions offer quick in-service training on the units as nursing staff are available. Nurses can also attend monthly 1-hour Fall TIPS Training webinars hosted by the Fall TIPS team as another helpful way to reinforce training before, during or after implementation. Register for upcoming webinars on the Fall TIPS Events page.